^ 3.0 3.1 Countries. WHO. [4 February 2012]. 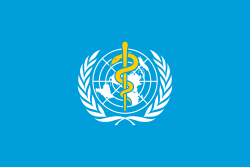 ^ Appendix 1, Members of the World Health Organization (at 31 May 2009) (PDF). World Health Organization. [18 November 2010]. ^ 5.0 5.1 Burci, Gian Luca; Vignes, Claude-Henri. World Health Organization. Kluwer Law International. 2004. ISBN 978-90-411-2273-5. ^ 钱中兵 (编). 世界卫生大会拒绝讨论邀请台湾地区参加世卫大会提案侧记. 新華社. 2017-05-23 （中文）. ^ Regional Office for Europe. WHO. [11 February 2012]. ^ Regional Office for South-East Asia. WHO. [11 February 2012]. ^ Regional Office for the Western Pacific. WHO. [11 February 2012]. ^ 陈冯富珍当选世卫组织新任总干事. 新华网. 2006年11月6日 [2008年9月19日] （中文）. ^ 千年发展目标. 世界卫生组织. [2018-02-09] （中文（中国大陆）‎）. ^ 脊髓灰质炎. 世界卫生组织. [2018-02-08] （中文（中国大陆）‎）. ^ 艾滋病毒/艾滋病. 世界卫生组织. [2018-02-08] （中文（中国大陆）‎）. ^ 世界卫生组织 | 世界卫生组织全球行动计划—在消灭特定型别野生脊髓灰质炎病毒和相继停用口服脊灰疫苗后最大程度降低脊灰病毒设施相关风险. WHO. [2018-02-08]. ^ 消除肝炎：世卫组织. 世界卫生组织. [2018-02-08] （中文（中国大陆）‎）. ^ 世卫组织消除结核病部长级会议承诺在2030年之前消除结核病(2:40) | 联合国电台. www.unmultimedia.org. [2018-02-08] （中文（中国大陆）‎）. ^ 2016-2021年全球卫生部门艾滋病毒战略. 世界卫生组织. [2018-02-08] （中文（中国大陆）‎）. ^ 关于世卫组织全球疟疾规划. 世界卫生组织. [2018-02-08] （中文（中国大陆）‎）. ^ World Health Organization. Agreements with Other Intergovernmental Organizations (PDF). [7 May 2012]. ^ Independence for WHO. Appeal by Health Professionals for Independence of the World Health Organization (PDF). [19 April 2011]. ^ Women in Europe for a Common Future. Open letter on the WHO/IAEA Agreement of 1959 (PDF). [19 April 2011]. ^ World Health Organization Accomodates Atomic Agency. Activist Magazine. 3 June 2007 [27 March 2012]. （原始内容存档于2007年9月28日）. ^ Staff. UN: Spread of polio now an world health emergency. AP News. 5 May 2014 [5 May 2014]. ^ Gladstone, Rick. Polio Spreading at Alarming Rates, World Health Organization Declares. New York Times. 5 May 2014 [5 May 2014]. ^ 世衛無能 害伊波拉殃全球 | 蘋果日報. 蘋果日報. [2018-02-09] （中文（台灣）‎）. ^ 陳馮富珍世衞告別演說　承認伊波拉危機犯錯. on.cc東網. [2018-02-09] （中文（香港）‎）. ^ WHO年花60億出差 主管爽搭頭等艙 (頭等艙,who,...) - 時事 - 國際 - 中時電子報. 商業周刊 - 商周.com. [2018-02-09] （中文（台灣）‎）. ^ WHO出差開支年耗60億　對抗疾病卻喊窮 --上報. [2018-02-09].